Lymphatic filariasis is a neglected tropical disease caused by three different species of parasitic worm, which are spread between human hosts by mosquitos. The molecular interactions between the worm, mosquito, and human are dynamic and delicately balanced, suggesting that disrupting these interactions might be an avenue for the development new therapeutic treatments. The worm Brugia malayi (image), one of the parasites that causes elephantiasis, develops as larvae inside the mosquito vector until it reaches the infective L3 stage at which point it is transmitted back into a human host when the mosquito takes a blood meal. The adult worms live and mate within the human lymphatic system while offspring are shed into the bloodstream to be picked up again by mosquitoes. While the life-cycle is well documented it has been difficult to define the exact molecules that the parasite uses to control its hosts. Research has traditionally searched for secreted proteins and, while there are several candidates, along with proteins expressed on the surface of the parasite that may play a part, recent research, carried out by scientists at Iowa State University, together with collaborators at Northewestern University, the University of Georgia, and the University of Wisconsin-Madison, has revealed that small non-coding RNAs carried in exosome-like vesicles (ELVs) may also be involved in controlling the host’s response to the parasite. This new research was published online on September 24, 2015 in the open-access journal PLOS Neglected Tropical Diseases. St. Jude Children's Research Hospital scientists have discovered evidence of a mechanism at the heart of amyotrophic lateral sclerosis (ALS) and related degenerative diseases. The research appears in today's September 24, 2015 issue of Cell and highlights a possible new treatment strategy for the devastating disorders. The article is titled “Phase Separation by Low Complexity Domains Promotes Stress Granule Assembly and Drives Pathological Fibrillization.” The St. Jude’s study focused on usually short-lived compartments called stress granules that form in cells under stress. Stress granules are just one type of the membrane-less structures or organelles that assemble as needed to handle various cell functions and then rapidly disperse. Until now, however, the mechanism underlying stress granule formation was poorly understood. Stress granules are also tied to degenerative disorders such as ALS, which is also known as Lou Gehrig's disease. Genes encoding the protein components of stress granules are often mutated in patients with ALS and other diseases. These same proteins accumulate in thread-like deposits called amyloid fibrils in the nerve and muscle cells of patients with ALS, frontotemporal dementia (FTD), and inclusion body myopathy (IBM). But the unifying mechanism was a mystery. "This study provides the mechanism that links stress granules, toxic fibrils, and disease," said co-corresponding author J. Paul Taylor, M.D., Ph.D., a Howard Hughes Medical Institute (HHMI) Investigator and Chair of the St. Jude Department of Cell and Molecular Biology. Mitochondria are not only the power plants of our cells, these tiny structures also play a central role in our physiology. Furthermore, by enabling flexible physiological responses to new environments, mitochondria have helped humans and other mammals to adapt and evolve throughout the history of life on earth. A pioneering scientist in mitochondrial biology and world-renowned expert on these critical organelles, Douglas C. Wallace, Ph.D., Director of the Center for Mitochondrial and Epigenomic Medicine at The Children's Hospital of Philadelphia (CHOP), synthesizes evidence for the importance of mitochondria in a provocative Perspective article published today, September 24, 2015, in the journal Cell. The Cell article is titled “Mitochondrial DNA Variation in Human Radiation and Disease." 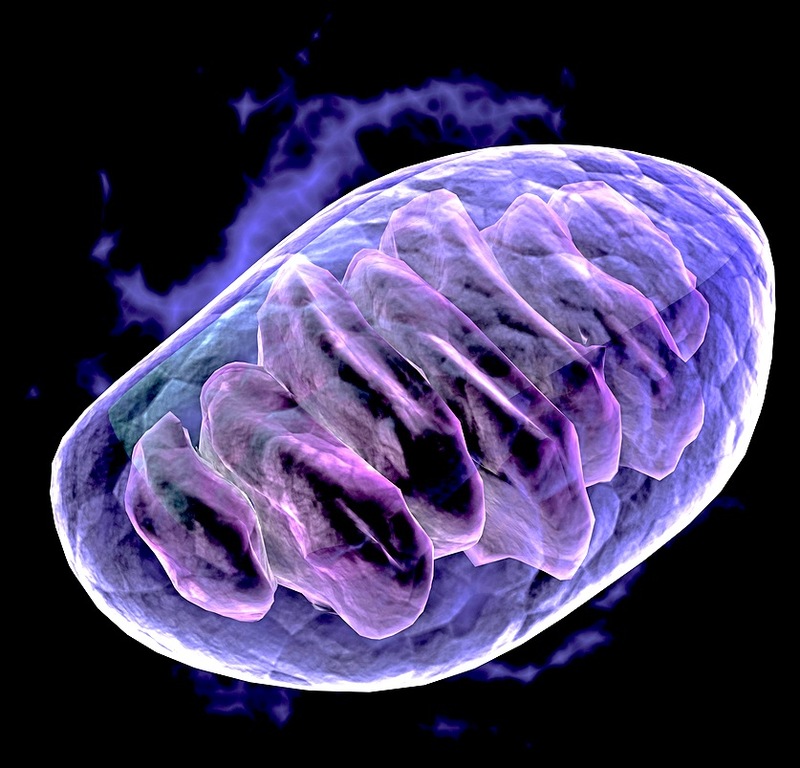 Residing in large numbers outside the nucleus of every cell, mitochondria contain their own DNA, with unique features that "may require a reassessment of some of our core assumptions about human genetics and evolutionary theory," concludes Dr. Wallace in his Cell article. Dr. Wallace has investigated mitochondria for more than 40 years. In 1988, he was the first to show that mutations in mitochondrial DNA (mtDNA) can cause inherited human disease. His body of research has focused on how mtDNA mutations contribute to both rare and common diseases by disrupting bioenergetics--chemical reactions that generate energy at the cellular level. Dr. Wallace and colleagues previously showed, in the late 1970s, that human mitochondrial DNA is inherited exclusively through the mother. They then used this knowledge to reconstruct the ancient migrations of women by comparing variation in mtDNA among populations throughout the world. Rapamycin, an FDA-approved drug that extends lifespan in several species, prevented Parkinson's disease (PD) in middle-age mice that were genetically fated to develop the incurable neurodegenerative motor disease that affects as many as one million Americans. While the rapamycin did great things for the mice, scientists in the Andersen lab at the Buck Institute for Research on Aging in Novato, California, also got an unexpected dividend from the research - a new understanding of the role the parkin protein (image) plays in cellular dynamics, one that challenges the current dogma in PD research and presents new opportunities for drug discovery. The Buck Institute study was published in the September 16, 2015 issue of The Journal of Neuroscience. The article is titled “Mitochondrial Quality Control via the PGC1alpha-TFEB Signaling Pathway Is Compromised by Parkin Q311X Mutation, But Independently Restored by Rapamycin.” "Given its side effects as an immunosuppressant, there are issues with long-term use of rapamycin, but the results of our study suggest that use of derivatives of rapamycin, or other agents with similar biological properties, may constitute novel therapeutics for the disorder," said senior scientist and Buck faculty member Julie Andersen, Ph.D. "Our discoveries regarding parkin may provide an even more important therapeutic target for PD." Parkin is a protein encoded by the PARK2 gene in humans. Mutations in PARK2 are most commonly linked to both sporadic and familial forms of PD; they diminish the cell's ability to recycle its internal garbage. PD is characterized by the accumulation of damaged proteins and mitochondria in the area of the brain where the neurotransmitter dopamine is produced. Rapamycin prevented PD symptoms from occurring in middle-aged mice who had a human mutation in the PARK2 gene. In 1952, the legendary British mathematician and cryptographer Alan Turing proposed a model, which assumes formation of complex patterns through chemical interaction of two diffusing reagents. Russian scientists have recently managed to prove that the corneal surface nanopatterns in 23 insect orders completely fit into this model. Their work was published in the September 22, 2015 issue of PNAS. The article is titled “Diverse Set of Turing Nanopatterns Coat Corneae Across Insect Lineages.” The author state that to their knowledge this is the first-ever biological example of Turing nanopatterns. The study was performed by a team working in the Institute of Protein Research of the Russian Academy of Sciences (Pushchino, Russia) and the Department of Entomology at the Faculty of Biology of the Lomonosov Moscow State University. It was supervised by Professor Vladimir Katanaev, who also leads a lab at the University of Lausanne, Switzerland. Dr. Artem Blagodatskiy and Dr. Mikhail Kryuchkov performed the choice and preparation of insect corneal samples and analyzed the data. Dr. Yulia Lopatina from the Lomonosov Moscow State University played the role of expert entomologist, while Dr. Anton Sergeev performed the atomic force microscopy. The initial goal of the study was to characterize the anti-reflective three-dimensional nanopatterns covering insect eye cornea, with respect to the taxonomy of studied insects and to gain insight into their possible evolution path. The result was surprising as the pattern morphology did not correlate with insect position on the evolutionary tree. Instead, Russian scientists have characterized four main morphological corneal nanopatterns, as well as transition forms between them, omnipresent among the insect class. 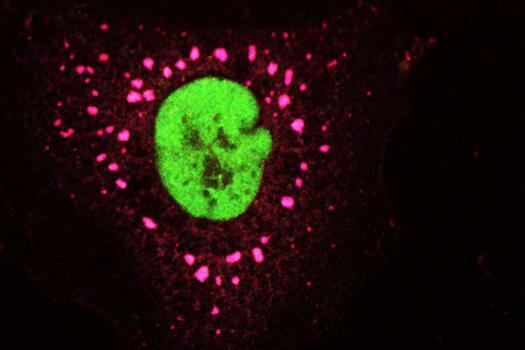 University of Texas (UT) Southwestern physiologists, trying to understand the genetic code, have discovered a previously unknown code that helps explain which protein should be created to form a particular type of cell. The human body is made up of tens of trillions of cells. Each cell contains thousands of proteins, which determine how the cell should form and what functions it needs to perform. Proteins, in turn, are made up of hundreds of amino acids. The blueprint for each protein is specified by genetic codons, which are triplets of nucleotides that can code for 20 different types of amino acids. The way in which amino acids are linked together then determines which proteins are eventually produced, and in turn, what functions the cell will have. 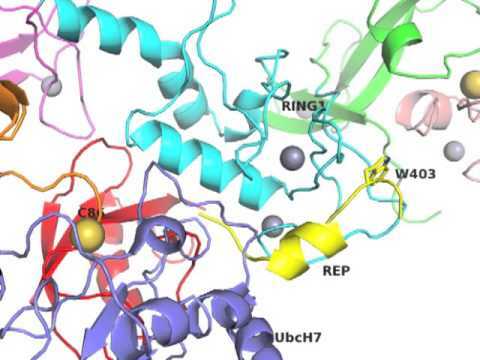 What researchers found was that, not only does the sequence of the amino acids matter, but so does the speed of the process in which the amino acids are put together into a functional protein. “Our results uncovered a new ‘code’ within the genetic code. We feel this is quite important, as the finding uncovers an important regulatory process that impacts all biology,” said Dr. Yi Liu, Professor of Physiology. It was long known that almost every amino acid can be encoded by multiple synonymous codons and that every organism, from humans to fungi, has a preference for certain codons. The researchers found that more frequently used codons − the “preferred codons” − speed up the process of producing an amino acid chain, while less frequently produced codons slow the process. The use of either preferred or non-preferred codons is like having speed signs on the protein production highway: some segments need to be made quickly and others slowly. “The genetic code of nucleic acids is central to life, as it specifies the amino acid sequences of proteins,” said Dr. Liu, the Louise W.
Cells that express neurogenin 3 (NGN3) may one day be harnessed to create a plentiful supply of insulin-producing beta cells for the treatment of diabetes, a study led by researchers at the University of South Florida (USF) suggests. NGN3 is the master gene driving development of the human endocrine pancreas, including the beta cells that make and secrete the hormone insulin, which helps control blood sugar levels. In type 1, or juvenile, diabetes, insulin-producing beta cells are generally destroyed by the person's immune system, and patients need insulin injections to survive. Patients with the more common type 2 diabetes, referred to as adult-onset diabetes, typically produce at least some insulin but their bodies cannot use it properly, and they often require extra insulin. In a study published on August 19, 2015 in the open-access journal PLOS ONE, researchers from the Children's Research Institute, USF Health Morsani College of Medicine; Johns Hopkins University School of Medicine; and the University of Illinois at Chicago, detected the NGN3 protein in histologically normal pancreatic biopsies from two sources -- cadavers and patients requiring biopsy for diagnostic purposes. 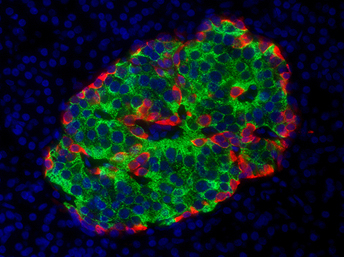 The PLOS ONE article is titled “Neurogenin 3 Expressing Cells in the Human Exocrine Pancreas Have the Capacity for Endocrine Cell Fate.” "NGN3 expression in the adult pancreas was unexpected, because it cannot be detected in the adult rodent pancreas - only during fetal development," said the study's principal investigator Michael Shamblott, Ph.D., an Endowed Chair of Pediatrics at the Children's Research Institute, USF Health Morsani College of Medicine, whose research focuses on regenerative cell therapies to replenish the insulin-producing cells destroyed or damaged by diabetes. Prion diseases--incurable, ultimately fatal, transmissible neurodegenerative disorders of mammals--are believed to develop undetected in the brain over several years from infectious prion proteins. In a new study, National Institutes of Health (NIH) scientists report they can detect infectious prion protein in mouse brains within a week of inoculation. Equally surprising, the protein was generated outside blood vessels in a place in the brain where scientists believe drug treatment could be targeted to prevent disease. The study, from NIH's National Institute of Allergy and Infectious Diseases (NIAID), was published online in the September 22, 2015 issue of mBio. The article is titled “Early Generation of New PrPSc on Blood Vessels after Brain Microinjection of Scrapie in Mice.” The first author of the study is Bruce Chesebro, M.D., Chief of the NIAID Laboratory of Persistent Viral Diseases. Scientists believe prion diseases could potentially be treated if therapy stwere to start early in the disease cycle. However, identifying who needs treatment and pinpointing the optimal time frame for treatment are open questions for researchers. Human prion diseases include variant, familial, and sporadic Creutzfeldt-Jakob disease (CJD). The most common form, sporadic CJD, affects an estimated one in one million people annually worldwide. Other prion diseases include scrapie in sheep; chronic wasting disease in deer, elk, and moose; and bovine spongiform encephalopathy (mad cow disease) in cattle. In their study, the NIAID scientists injected infectious scrapie prion protein into the brains of mice. After 30 minutes, they began observing whether the injected material generated new infectious protein at the injection site. As a potential treatment for Parkinson’s disease, scientists at the University of North Carolina (UNC) at Chapel Hill have created smarter immune cells that produce and deliver a neuron-healing protein to the brain, while also teaching nerve cells to begin making the protein for themselves. Associate Professor Elena Batrakova, Ph.D., and her team at the UNC Eshelman School of Pharmacy’s Center for Nanotechnology in Drug Delivery genetically modified white blood cells called macrophages to produce glial cell–derived neurotrophic factor (GDNF), and deliver it to the brain. Glial cells provide support and protection for nerve cells throughout the brain and body, and GDNF can heal and stimulate the growth of damaged neurons. “Currently, there are no treatments that can halt or reverse the course of Parkinson’s disease. There are only therapies to address quality of life, such as dopamine replacement,” Dr. Batrakova said. “However, studies have shown that delivering neurotrophic factor to the brain not only promotes the survival of neurons, but also reverses the progression of Parkinson’s disease.” In addition to delivering GDNF, the engineered macrophages can “teach” neurons to make the protein for themselves by delivering both the tools and the instructions needed: DNA, messenger RNA, and transcription factor. Successfully delivering the treatment to the brain is the key to the success of GDNF therapy, Dr. Batrakova said. Using immune cells avoids the body’s natural defenses. The repurposed macrophages are also able to penetrate the blood-brain barrier, something most medicines cannot do. The reprogrammed cells travel to the brain and produce tiny vesicles called exosomes that contain GDNF. The cells release the exosomes, which are then able to deliver the GDNF proteins to neurons in the brain. Researchers from Imperial College London and Newcastle University believe they have found a potential new way to target cells of the brain affected by Parkinson's disease. The new technique is relatively non-invasive and has worked to improve symptoms of the disease in a rat model. Parkinson's disease causes progressive problems with movement, posture, and balance. It is currently treated with drugs, but these have severe side-effects and can become ineffective after approximately five years. The only treatment subsequently available to patients is deep-brain stimulation, a surgical technique where an electrical current is used to stimulate nerve cells in the brain. In addition to being an invasive treatment, this approach has mixed results - some patients benefit, while others experience no improvement or even deteriorate. Researchers believe this is because the treatment is imprecise, stimulating all types of nerve cells, not just the intended target. The new study, published online on September 23, 2015 in an open-access article in the journal Molecular Neurodegeneration, examined a less invasive and more precise alternative, designed to target and stimulate a particular type of nerve cell called cholinergic neurons. These cells are found within a part of the brain called the pedunculopontine nucleus, or PPN. The article is titled “Pharmacogenetic Stimulation of Cholinergic Pedunculopontine Neurons Reverses Motor Deficits in a Rat Model of Parkinson’s Disease.” "If you were to peer inside the PPN, it is like a jungle with a massive variety of nerve cells that behave differently and have different jobs to do," said Dr. Ilse Pienaar, Honorary Lecturer in Neuroscience at Imperial College London. Scientists already suspect that cholinergic neuron cells are involved in Parkinson's disease.